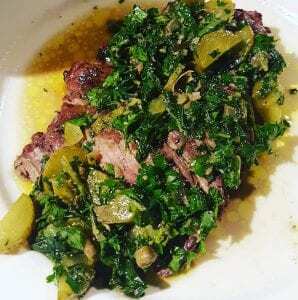 Flank Steak matched with Salsa Verde, what a power couple! I love this dead simple dish, its like meat and salad in one serve! Firstly youll be needing to whip up theSalsa Verde.Literally translated as Green Sauce, Salsa Verde has a great many variations and no hard rules. The basic objective is to create a piquant fresh and slightly acidic sauce to bring a light, bright and fresh flavour to dishes. It can be chopped coarse and rustic, or put through a food processor for a smoother sauce, the choice is yours. Once you have the basics you can start playing other flavours including an interesting variation from our friend, Mr Voodoo Bacon, George Francisco who adds lavender to his! Generously season thesteak with salt and pepper and place on very hot BBQ or grill. Turn when the one side has good colour, cook on the other side until medium rare.or mediumor medium well, but no more!..Ok fine, cook it how you like. Allow to rest for half of the cooking time, slice and cover with lashings of the Salsa Verde and allow flavours to mix and mingle for another couple of minutes. Serve and sit back and wait to receive your compliments. Unless you cooked it well done in which case its all on you. The post Flank Steak and Salsa Verde appeared first on Sunshine Coast Organic Meats.